The forces of marine erosion will continue to attack Cape Cod and the land will eventually be worn away. New lands built by waves, currents, and winds will not balance the loss of land to the sea. We can guess the rate of loss based on a few things we know. 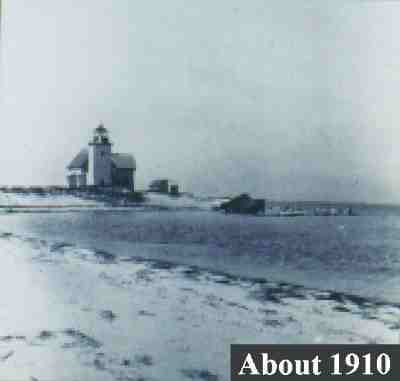 For example, we know that the cliffed ocean side of lower Cape Cod loses about 5 acres a year to marine erosion. New land constructed from this eroded material averages about 1 acre a year. Thus for each acre lost, less than half an acre is gained. Estimates for other parts of the Cape may very greatly from this figure. Figure 26. Billingsgate Island before the entire island was eroded away. It is clear that shore erosion is threatening the lighthouse as the sea wall of boulders was built in a futile effort to protect the lighthouse from wave attack. Unfortunately, the sea wall was poorly placed and actually increased the rate of erosion (photo provided by the Cape Cod National Seashore). But, at some distant time--not for many generations, however--Cape Cod may be nothing more than a few low sandy islands surrounded by shoals. It might be like Billingsgate Island that, in the middle 1800`s, was about a mile long and about a half a mile wide and included about 30 homes, a school house, and a lighthouse (Fig. 26). Today, Billingsgate island is a shoal that is exposed above sea level only during the lowest tides (Fig. 27). Figure 27. The remains of Billingsgate Island of Wellfleet. 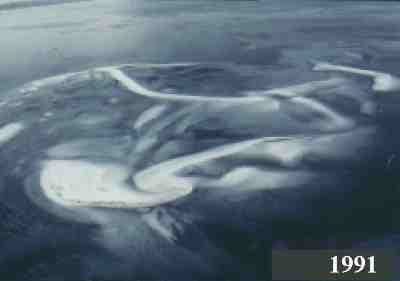 Photographed at about low tide in 1991. Today all that remains of the island is a shoal exposed during very low tides. Blocks of stone behind the boulders of the original riprap sea wall are all that remain of Billingsgate lighthouse. The fate of Billingsgate Island may be a precursor for Cape Cod as the sea continues to erode the fragile land (photo by Dann S. Blackwood, U.S. Geological Survey). The future Cape Cod could also be like Stellwagen Bank just to the north of Provincetown and be completely submerged. Nothing may be left to supply a group of hungry tourists with drink, food, or even an opportunity to fight with the "natives."